I don't know if this video has been posted yet but I love it! It always make me sad. DId you guys see the spoof with Taylor Swift on SNL? Too funny! Here's a video of the best Twilight shirt I've gotten. It actually changes in sunlight and sparkles!It's so cool! Most videos are not on Youtube anymore... afterthe fifth link I tried I gave up =P can you look for them again and post the new link? You probably have already seen these but I think they're worth remembering! Specially with the New Moon downpour of interviews... I had been hopiong to see these interviewers again but I haven't seen them yet. These are from last year, they're both Twilight interviews. My husband made me this for Christmas, I may be kind of biased but it's my favorite Twilight video, you guys should check it out and let me know what you think. You have to watch this it is amazing! Basically, someone took the audio from the New Moon trailer and mixed it with images from Beauty and the Beast. I was surprised how good it all worked out. Fans get so creative I love it! 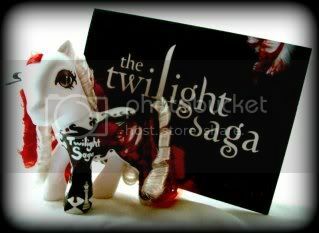 The Twilight world is so much more than just Edward/Bella! This is a Twilight themed song called "Vampire Bride" by a really talented guy called FreddeGredde (or just Fredde). I'd never seen a video showcasing the darker side of the Twilight saga, so I made one. Hope you enjoy!